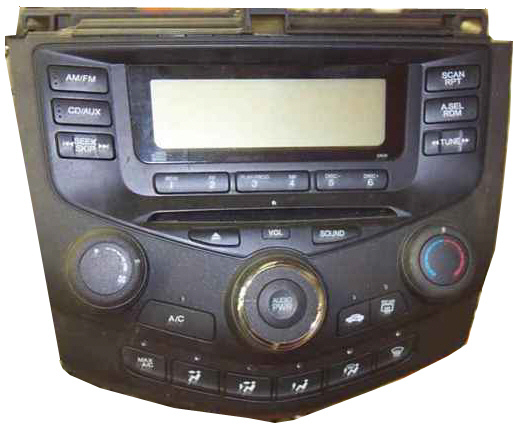 Honda Accord Car Stereo CD Changer Repair and/or add an AUX input. We have factory parts to repair your cd changer if it won�t play or eject the cds. These are very fragile so don�t let someone force anything inside or even take it apart. These do need new parts and the parts have to be put it exact or the player will not work. 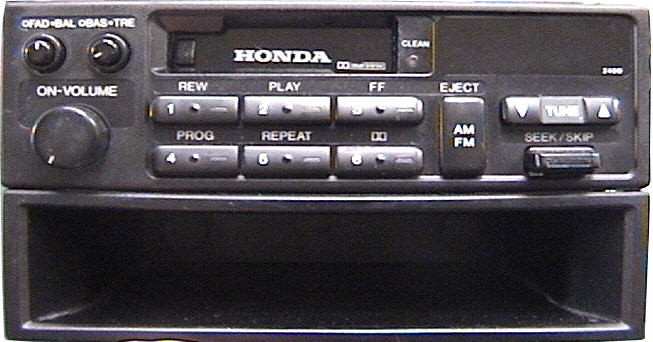 The Honda Accord cd changer is worth taking care of and having it fixed so it plays correctly. You wouldn�t want a stereo in there that doesn�t look right or fit right. Want to get your nice cd's out undamaged? The best way for the cd's to not be damaged and for the player to be repaired is to have an experienced tech take it apart. Send it in for repair in the players original broken stage and we will be able to see why it broke and see what it needs to work perfectly again for you. 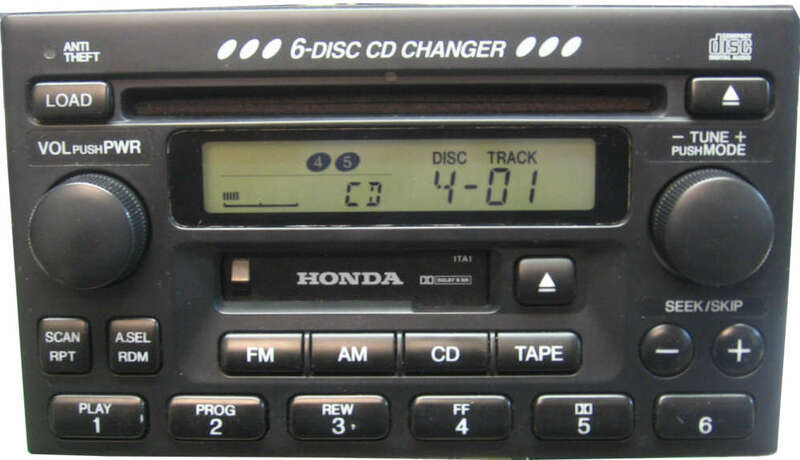 For 2003 and newer Accord in dash cd changers, in most cases we will not need the entire faceplate. 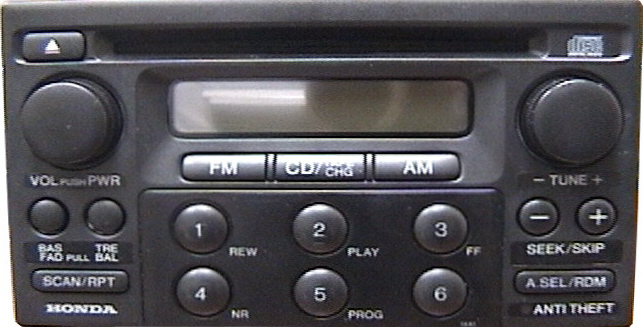 This allows you to keep the temp controls in the vehicle while the stereo is out for repair. For CD Changer problems and display lighting, we will only need the stereo box that is mounted behind the faceplate. Once the faceplate (photo'd above) is removed, you can see how the box unbolts from the backside (it's size is about 8" Wide X 7" Deep X 3" Tall) this is the portion to send in. The brackets on each side of the stereo box are anchored to the back of the faceplate with 3 screws for both left and right side brackets. These 3 screws need to be loosened a little to allow the brackets to spread so you can pull the box off. For removing the faceplate from the car, see Equipment Removal Tips here. Below are problems we have repaired on each part of the sound system. 2003-2005 Display out or Sound out after pop - Backlight out. Stereo comes on even when car is off, drains battery at night. 1998 Error code "PEO" on display and won't play CD's at times. 1993-1997 Won't eject, accept, or read (skips) CD's. 1988-1990 Shows dashes across display, won't accept. The below problems are in the changer usually mounted in the trunk. Error Code E-01, E-02, or higher. The amp is mounted in the trunk on the left side against the ceiling of the trunk with a metal cover over it for protection. Sometimes it is mounted on the right side of the trunk behind the liner. (Bose units have the word BOSE on the tape deck door). 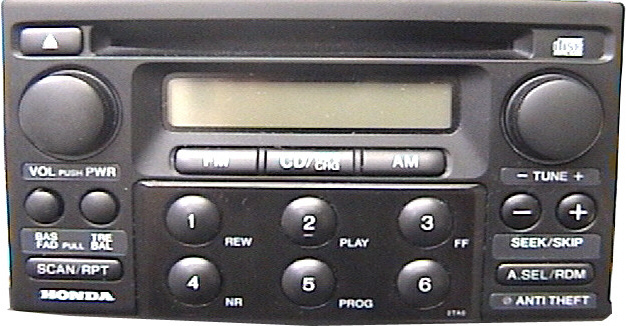 Most are anti-theft radios that require a 5-digit code when the battery or the stereo has been disconnected, in order for it to be turned back on. 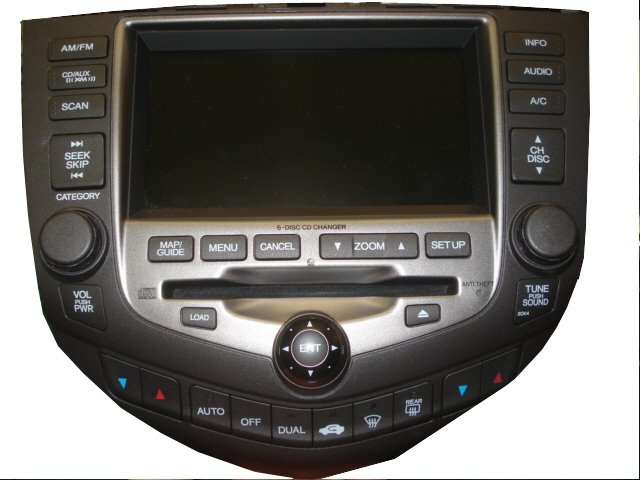 We repair Honda Accord CD players that skip or won't play CD's. These units are regular 4-Ohm speaker systems unless the stereo says BOSE on its stereo faceplate. These are some more of the units that we repair.